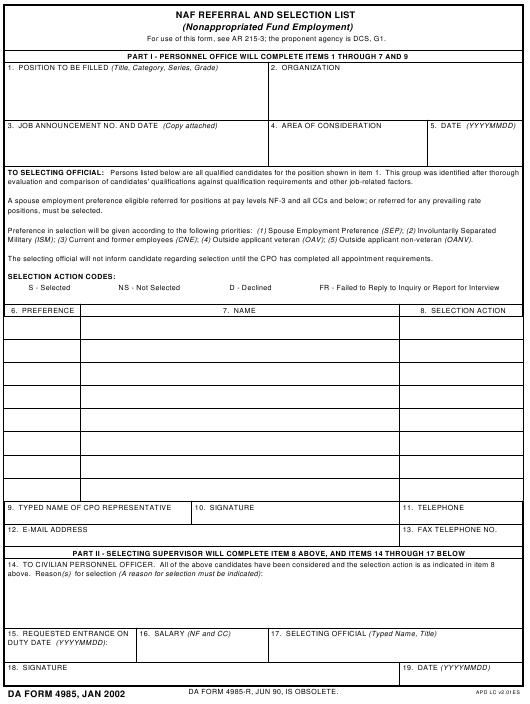 DA Form 4985 - also known as the "Naf Referral And Selection List (nonappropriated Fund Employment)" - is a United States Military form issued by the Department of the Army. The form - often mistakenly referred to as the DD form 4985 - was last revised on January 1, 2002. Download an up-to-date fillable PDF version of the DA 4985 down below or look it up on the Army Publishing Directorate website. evaluation and comparison of candidates' qualifications against qualification requirements and other job-related factors. Military (ISM); (3) Current and former employees (CNE); (4) Outside applicant veteran (OAV); (5) Outside applicant non-veteran (OANV). The selecting official will not inform candidate regarding selection until the CPO has completed all appointment requirements. DA FORM 4985-R, JUN 90, IS OBSOLETE.